I’m currently reading Emotionally Healthy Spirituality, and the author comments that we tend to define ourselves by our accomplishments. I certainly do. Specifically, I find a deep desire to do something truly great, to make a big difference. I want to look back at my life and see at least one giant contribution that made this world a better place, that helped many people. Before I go any farther, I must clarify that I love Star Wars. I mean to criticize not the movie, but my own idolatry, or as Yoda would say “attachment”. When I was a toddler, my mom would put the original Star Wars on for me. At the end, I would cry because it ended, so she put it on a second time. Same result, and a third time. This happened for about a month, and each viewing culminated in the throne room ceremony. Putting these points together, I realized my life goal, my deep desire is to destroy a Death Star. Now, that is an incredible feat, a significant accomplishment. It is huge, decisive, and easily noticeable. This work has a clear beginning and end, and a few individuals can take the credit. It even results in recognition by a hundreds of people! While I doubt my repeated watching resulted in this desire, the film really portrays it well. Clearly, Luke and Han play an indispensable role in destroying the Death Star. But in C.S. 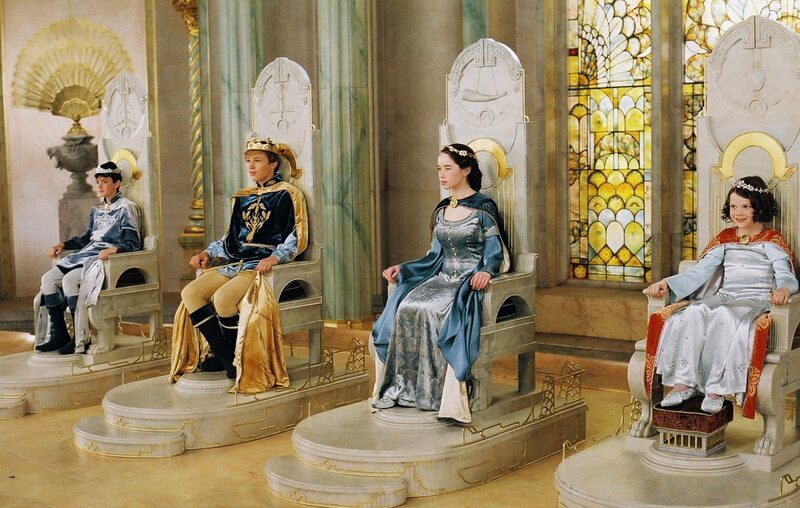 Lewis’s The Lion, the Witch, and the Wardrobe, which also ends in a throne room, what incredible feat do the children accomplish? Peter, Susan, Edmond, and Lucy defeat the white Witch. Sort of. They may have had clever tricks and brave moments, but they would have lost without Aslan. None of the four can take any credit for Aslan’s resurrection or victory. If not military success, what did they do worthy of reward? They stick close to Aslan, and they seek to help others. Of course, Edmond nearly ruined everything, but he still finds himself on the stage. Disregarding accomplishments, Aslan crowns them as kings and queens because they are “sons of Adam and daughters of Eve”. Simply put, they are people, and people have value. Even better than metals, they receive crowns. © Walt Disney Pictures. Which Throne Room Do You Seek? In Aslan, we find a picture of Jesus Christ who honors us, not because of what we do, but because of who we are. This is not to say our actions don’t matter. Surely, Edmond’s treachery, which included his desire to rule over his brother and sisters, deserved punishment. He would not have become king had Aslan not sacrificed himself on Edmond’s behalf, which symbolizes Christ’s death for us. Furthermore, our actions matter to others. The galaxy needed the heroic works of Luke and Han, and in Aslan’s plan, Narnia needed the leadership of Peter, Susan, Edmond, and Lucy. But, if God deems us valuable, worthy of love and honor, simply due to our being people made in His image, can I tell him, “You’re wrong. I don’t matter until I accomplish something significant.”? I must not consider myself or my life incomplete until I destroy a Death Star. Both Star Wars and The Chronicles of Narnia highlight a related fallacy. While I’ve already pointed out how the Pevensies could not take credit for Narnia’s liberation, Rogue One emphasizes how many people play a crucial role in the destruction of the Death Star. It is not the work of two brave heroes, but the achievement of many. Hence, hubris makes it my goal to do something great, at least in a way I could take the credit. In Star Wars, the will of the Force destroys both the Death Star and the Sith, bringing balance to the galaxy. In The Lion, the Witch, and the Wardrobe, Aslan saves the children and Narnia. In the real world, Jesus rescues us from our brokenness and will transform the world into utopia. What life goal shall I pursue? From a desire to prove myself, shall I seek a great accomplishment? Instead, I must humbly do my role, which might appear small or big, in the great work that God is orchestrating. At the same time, I can rest in the knowledge that I already have immeasurable value. What goal will you strive after? Are you enslaved to the illusory pursuit of the throne room of accomplishment, or do you receive honor from Jesus for simply being you? Next Next post: Does Jesus follow Joseph Campbell’s Hero’s Journey?